I’m a huge fan of anything wagyu-related. You name it, I’ll eat it — wagyu steaks, wagyu shabu shabu, wagyu tartare… Mmm. That’s why I jumped at the opportunity to visit Gyu & Tori, a kiosk hidden in Paragon’s basement. Because I found out that it sold super affordable wagyu burgers, sandwiches and donburis. Think under S$16, and some are even priced at S$9.90! Opened in November 2018, Gyu & Tori’s storefront is attractive and bright. There are plenty of quaint posters, banners and knick-knacks promoting its menu and latest seasonal additions. However, what caught my eye is the slabs of wagyu beef plated in a glass cabinet near its cashier. 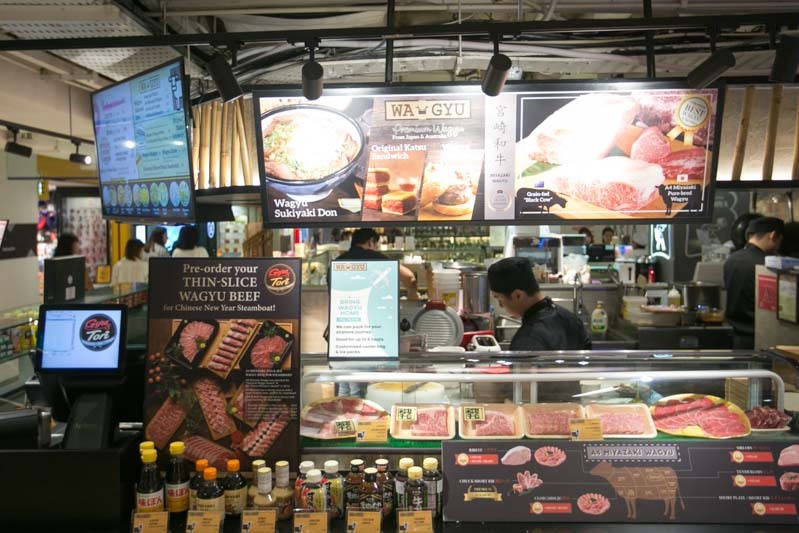 Gorgeously marbled chunks of wagyu beef, of varying cuts, sizes and thinness, were displayed beside a poster that explained which cuts of beef are best used for different methods of cooking. For example, the chuck is used for short ribs, while the breast is used for brisket. Do note that Gyu & Tori operates mostly as a take-away kiosk. It has a tiny dining area that fits four people, but that tends to fill up quite fast! 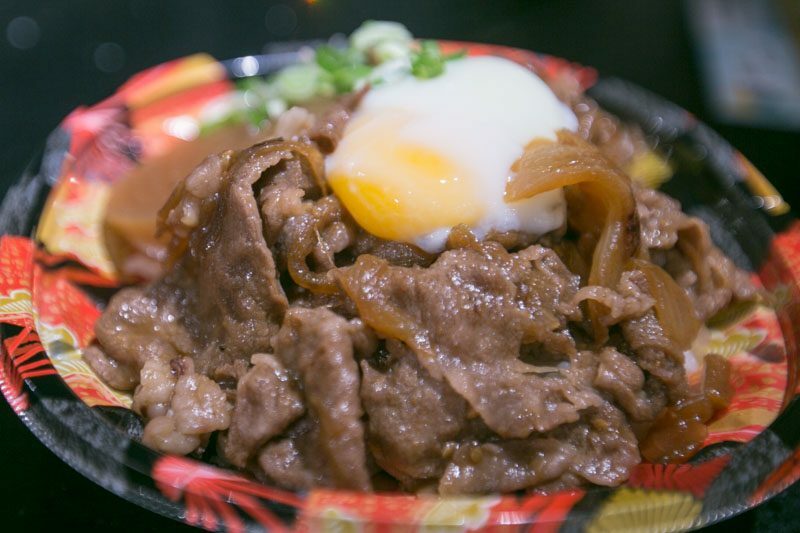 The first dish up on our list was the A4 Miyazaki Wagyu Sukiyaki Don (S$15.90). 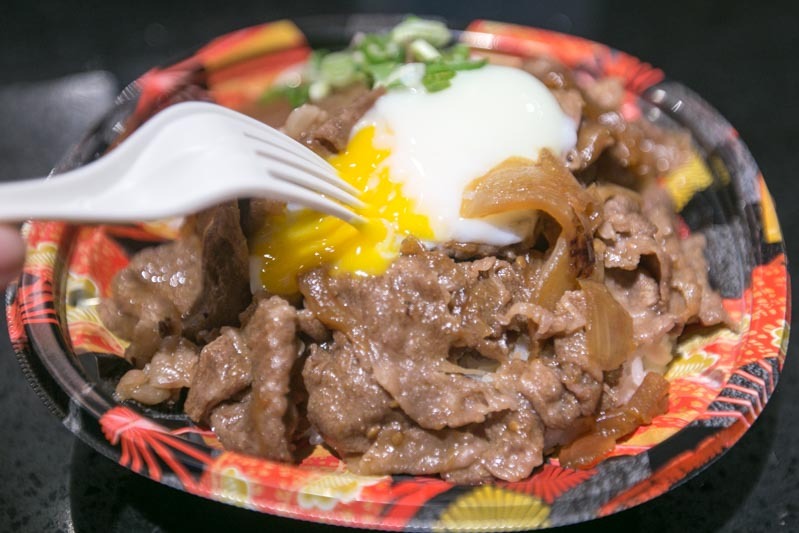 Tender, thinly sliced pieces of Miyazaki wagyu beef were marinated in a sweet sukiyaki broth. It’s then served with sweet onions, a wobbly onsen egg, simmered daikon, and chopped scallions. 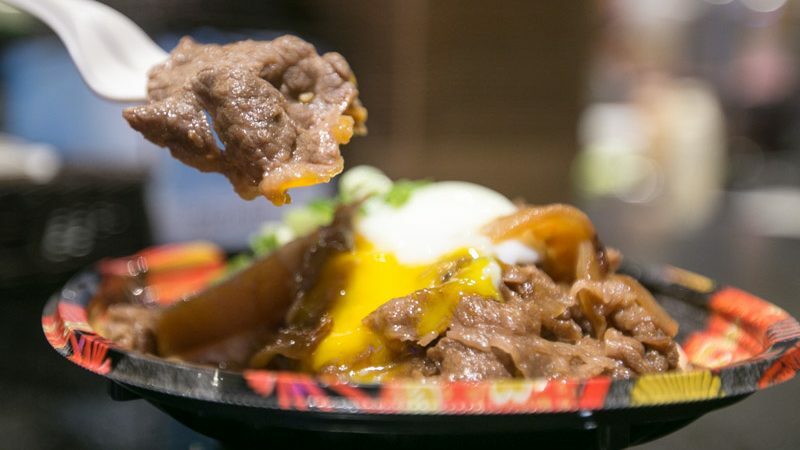 If you’re looking for a wallet-friendly version of this dish, try Gyu & Tori’s Australian Wagyu Sukiyaki Don (S$9.90). We were super delighted to see that the onsen egg was perfectly cooked. The egg white was firm while the yolk was still beautifully runny. Gently poking into the egg resulted in a liquid golden river of yolk. 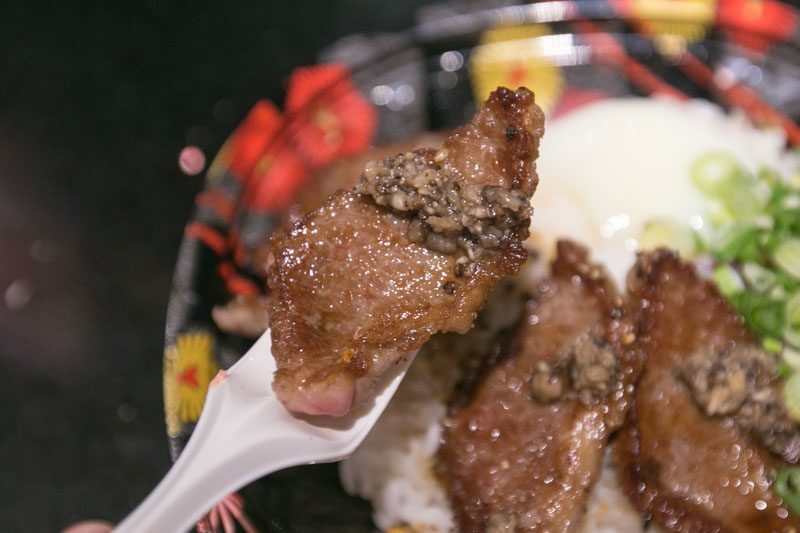 While some might prefer to dip their beef slices into the egg, I mixed mine directly into the rice to create a silky-smooth and almost butter-like texture with every bite. Needless to say, the thinly sliced pieces of wagyu were tender, soft and sweet. I liked how juicy they were despite being paper-thin, and the natural sweetness from the beef went hand in hand with the sweet and savoury sukiyaki broth. My only gripe with this dish would have to be the rice. Though sweet and fluffy, just like white Japanese pearl rice, it was a tad too moist for my liking. I prefer my Japanese white rice sticky and firm, like sushi rice. 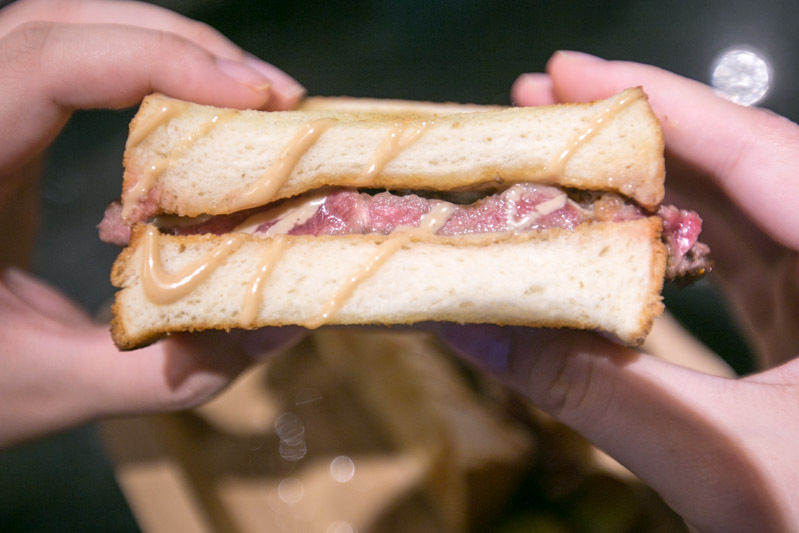 Next, we tried Gyu & Tori’s Gourmet Ribeye Steak Sandwich (S$15.90). Consisting a thin cut of Australian ribeye steak that’s grilled to a pinkish-red hue, this dish comes drizzled with sweet tonkatsu sauce and one side dish of your choosing. 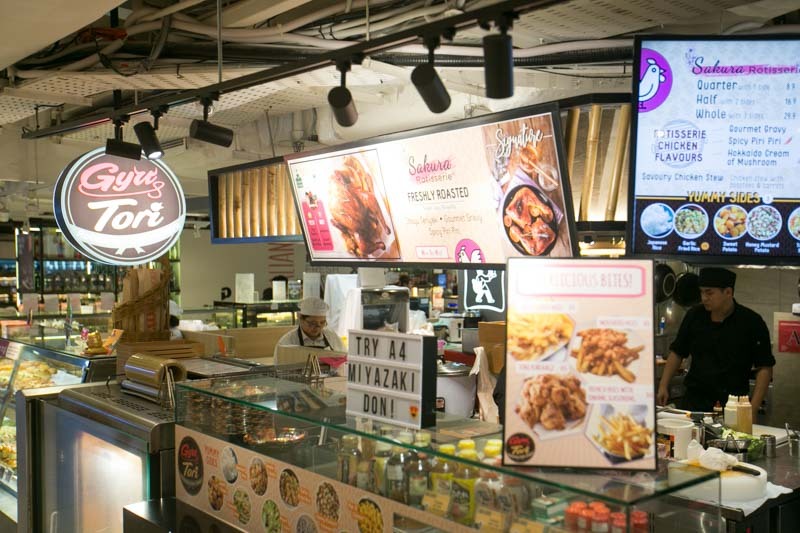 You can pick between 10 sides, such as Japanese rice, garlic fried rice (additional S$1), honey mustard potatoes or mac & cheese. We chose the sweet potatoes, which were baked and sliced. I’ve got to say, I loved my first bite into this sandwich. The thick piece of bread was buttered and toasted till it was firm and crispy on the outside, but soft and fluffy on the inside. The beef had a good seared crust, which resulted in a nutty and roasted exterior that gave an audible crunch when I bit into it. I expected the beef to melt like butter, but I was slightly disappointed to find the beef stringy and tough to chew, as if it had been cut along the grain rather than against it. 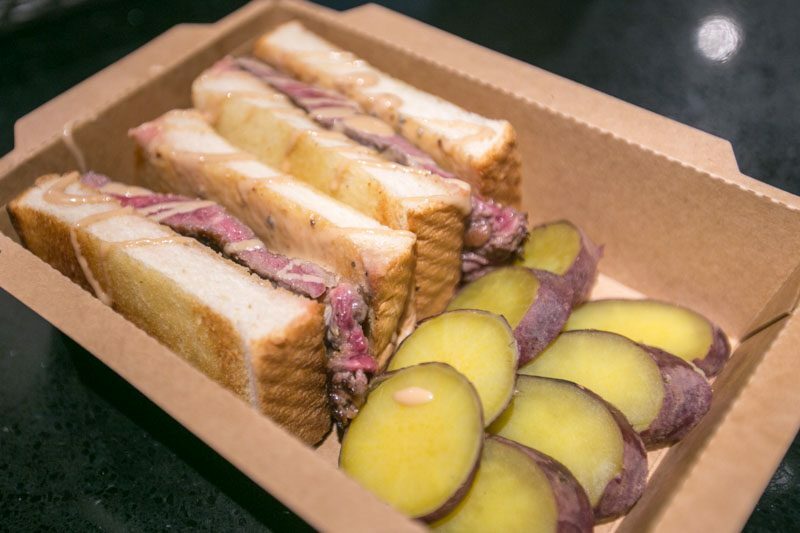 I even had problems getting a clean bite out of the sandwich and had to forcibly pull the beef apart by hand. 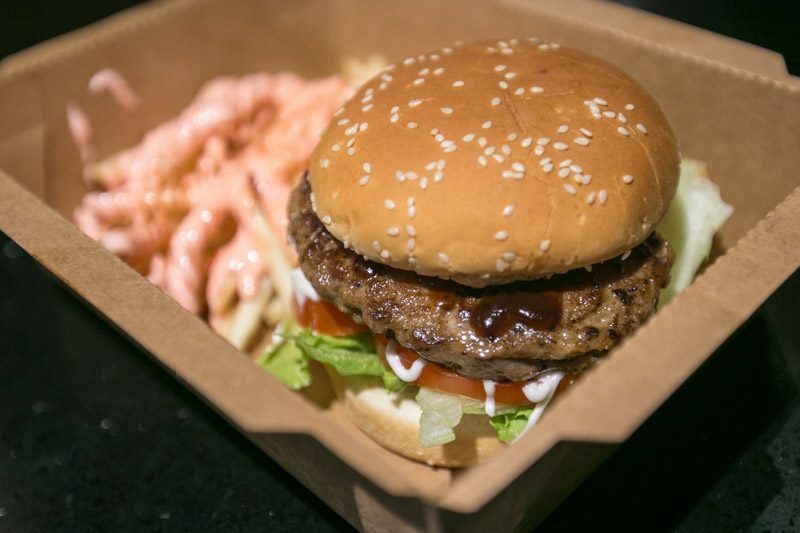 The Wagyu Burger (S$9.90) came with one side. We chose the Mentaiko Fries, which we had to top up S$2 for. The mentaiko used for the fries was authentic, and I could identify real bits of cod roe within the sauce. I absolutely loved the wagyu burger. 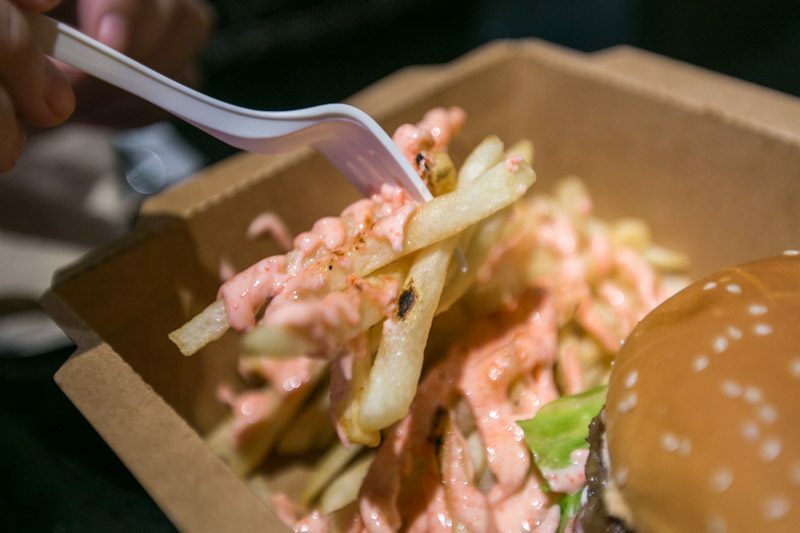 The patty was finely diced and combined together, just like steak tartare. 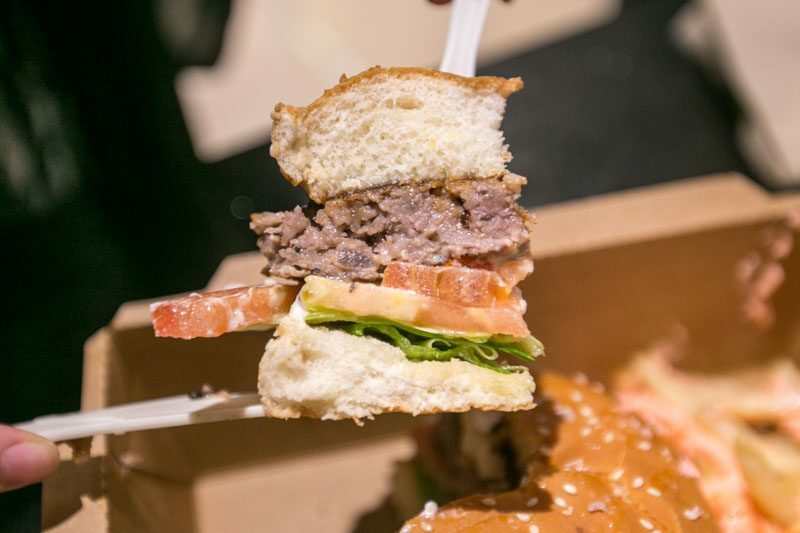 We were told that the beef used was from the wagyu steaks’ trimmings, which would explain how gorgeously fatty, marbled and soft the patty was. Biting into the patty itself was like biting into butter, with a smoky exterior thanks to its time on the grill. Because of how much fat there was in the patty, the meat literally melted in my mouth, leaving a luscious creamy-like aftertaste which I relished in. The other components of the burger were nondescript and my dining companions and I ended up eating the patty by itself, leaving the buns and vegetables behind. As you might have guessed from its name, which is translated to “beef and chicken” literally, Gyu & Tori also serves up rotisserie chicken. 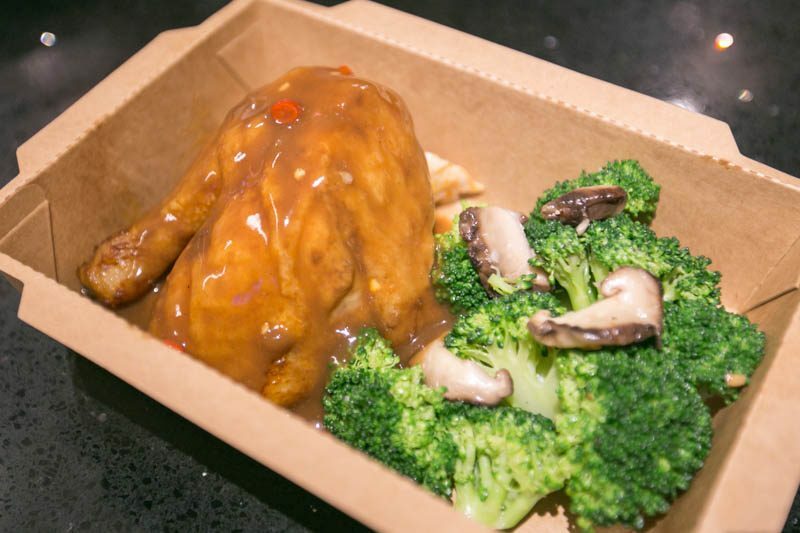 We got the Quarter (S$8.90) with spicy piri piri sauce, and chose Broccoli & Shiitake as our side. The chicken meat was one of the most tender I’ve ever tasted. It was perfectly cooked — not too tough or stringy, but soft and juicy, with no sign of uncooked meat or even a hint of blood. 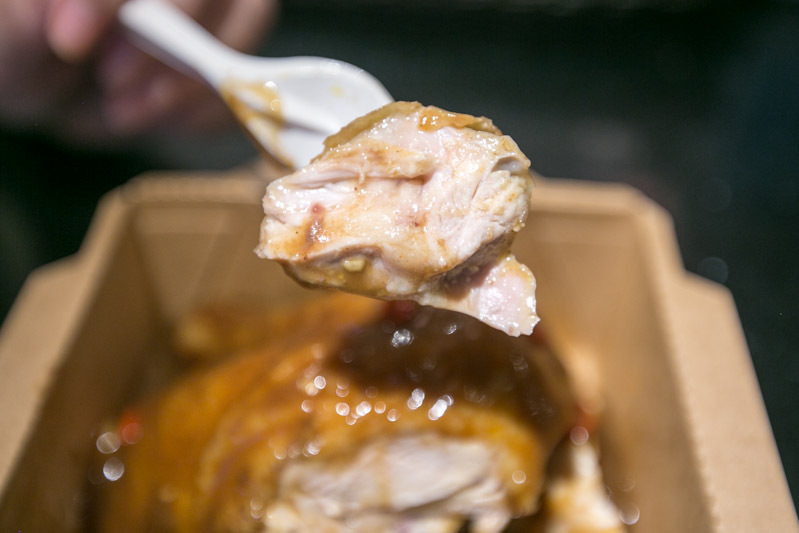 Gyu & Tori told us that the secret to its perfectly cooked rotisserie chicken was its preparation method. It had been brined for two whole days before being cooked. Plus, the team at Gyu & Tori only choose chicken which has zero growth hormones, so the meat is as natural as you can get. I expected the spicy peri peri sauce to be tangy and peppery, but instead it was mild and savoury, like a saltier version of a mushroom cream sauce. Oddly enough, the savoury brown sauce complemented the silky-smooth chicken meat. 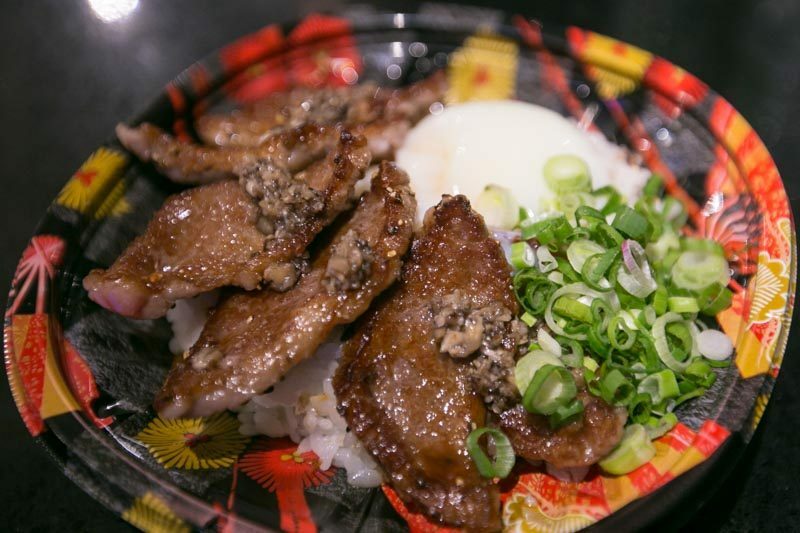 The third most expensive dish on Gyu & Tori’s menu was the A4 Karubi Truffle Wagyu Sukiyaki Don (S$21.90). One of the most popular cuts, karubi beef has more marbling than most roast cuts do and because of that, it’s known to be more tender and juicy. Armed with this fact, I was pretty excited to try the glistening pieces of truffle wagyu. Though the slices of karubi truffle wagyu were pretty thin, they were still grilled to a glorious baby pink on the inside. The meat had a slight toughness to it — I assume that’s because it had been grilled — but once I bit past its crust, it was sweet and soft on the inside. As the meat melted in my mouth, it had a deliciously buttery finish to it, and an earthy and rich aftertaste from the truffle. 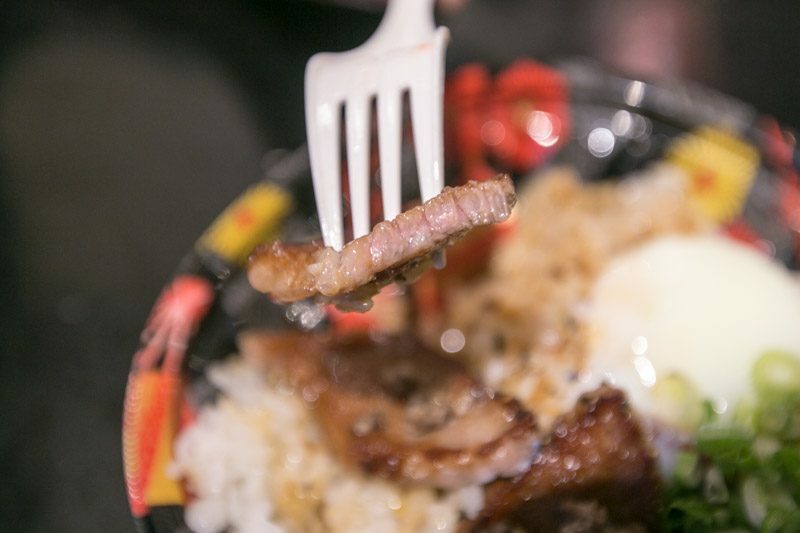 Some dishes were a hit or miss, with the beef being a little tough at times and the rest of the dish’s components being pretty ordinary. However, I’d be willing to travel all the way to Paragon just to devour these mouthwatering bowls of wagyu beef considering they’re all priced at an average price of S$10 to S$16. I was pleasantly surprised by how good its rotisserie chicken was — it’s definitely one of the best I’ve ever tasted. I’d go as far to say that if I return, I might give the wagyu a pass and just head straight for the tender chicken instead.